It’s 4am here in Rwanda and this seems to be my wake up and think time here – so before the rest of Nyamagabe wakes up I thought I would tell you a little of what I have learned about the work the local organisation we are supporting is doing here to facilitate change for women in poverty. I hope this fills in the gaps in understanding why I am here! 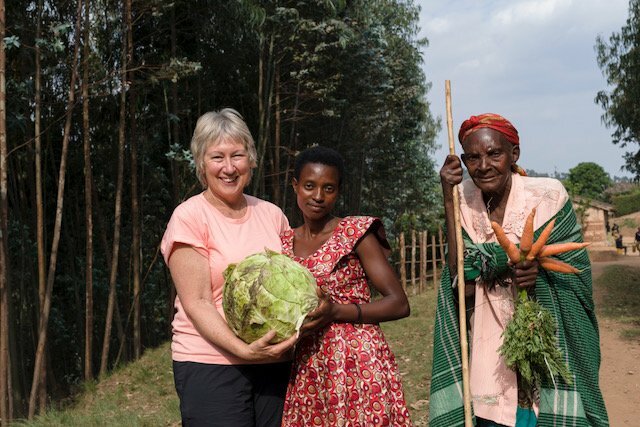 The Self Help Group initiative was started and is run by African Enterprises Rwanda, a local NFP, to help women who live in villages where extreme economic hardship and war have created a sense of isolation, aloneness and in most cases abject poverty. Yesterday I posted up a video on my FB of the formation of three SHG’s in the village of Nyamigina, about 45 minutes from where we are staying. AEE staff facilitated the meeting, explaining to the women what happens in a SHG and helping the men to understand what is possible for the women. Not all the men fully comprehended that they were not missing out, that the benefits would be widespread. Some village women were too shy or ashamed to attend but hopefully, over time, more will join. AEE Rwanda believes that by teaching a woman, it doesn’t just change her, but her family and then her village. All benefit. This is certainly true from what we have seen earlier this week while speaking with already established groups. These women will learn to save. Each group decides at their formation how much they can save, all members will bring that much each week into their group. This 8-16c AUD$ a week will form the basis of loans they will later take out to start their business ventures. Over the next 6-12 months, AEE will provide these groups with personal development and vocational training, attend village community meetings to ensure community support, teach business skills and provide entrepreneurship mentoring and support to each group. The women learn to form small individual or group businesses. They will stay in these SHG’s for life; working together, supporting and encouraging each other. They share their problems and their successes with each other. They learn to grow their own food and care for themselves. Their hearts are no different to ours. They want to be able to look after and feed their children and themselves, send their children to school, provide for their needs, have a home, support their communities. Basic health care comes with insurance in Rwanda and for many we have spoken with, to pay for health insurance was a group goal to achieve for each of the women within the first year of starting their group. Some women become advocates for women in their villages and some become local community leaders and development advocates across their districts. These women are now being heard. They have a voice in their communities and in their country. The women in Self Help Groups are not being given a handout but are receiving a hand up. The Self Help Group approach is working. It is changing not just their lives and that of their families, but whole villages are benefiting as the scale of the economy grows. It is really obvious to see. All this week women in groups have been sharing with us stories of social, economic and human rights benefits, supportive friendships, successful businesses, improved family health, health insurance, access to child and adult education, as well as a decrease of domestic violence. They no longer suffer isolation, fear, shame, loneliness or embarrassment. One of the things I have seen that has really excited me is the ripple effect that is happening. Each SHG elects two women to be part of a cluster group of 20 representatives. The cluster groups are electing to support and start youth SHG’s themselves, sharing their knowledge and experience with these young people. Youths born into poverty with no knowledge of how to break that cycle. The young people are running with this. They now have businesses and are making small incomes, supporting their parents, brothers and sisters. They now have hope. Their respect for these women was so obvious as we talked to them. The AEE staff who have taken us around this week, introducing us to the groups they work with, are amazing. They love their country. Their hearts are for their people. They work hard to help these women make changes in their lives, staying in the town we are in and returning to their own wives and families on the weekends. They are seeing the results of their work, but there is still a long way to go. My contribution here has been to learn and partner with them through Foxglove Project to help get as many women as possible into these groups. Every $30 we contribute means we partner with one woman in a SHG for life. It’s crazy that $30 is all it takes. But it’s working. And I feel blessed to have been able to see that and to bring these stories home to you. Now it’s time to pack, have breakfast and head out of town! P.S. It’s not too late to make a donation. $30 is all it takes.